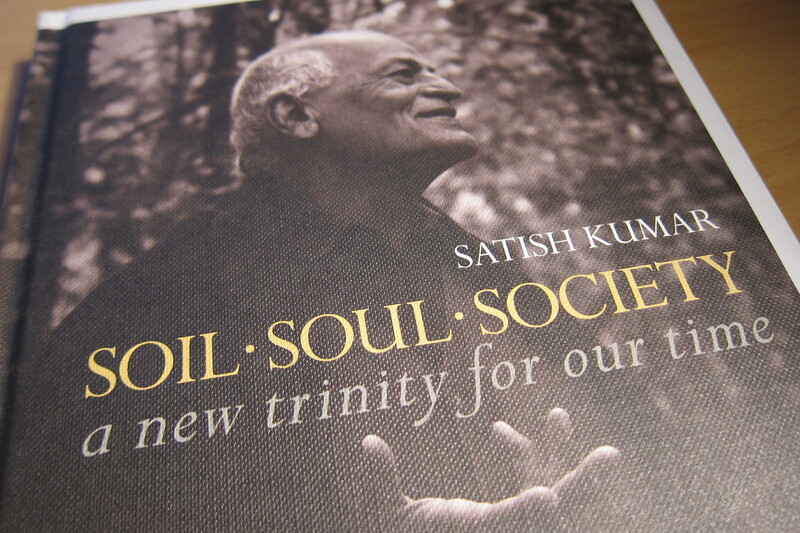 Soil, Soul, Society: A New Trinity of Our Time is the latest book from Satish Kumar, published by Leaping Hare Press. I have hopefully shown in my photo above how gorgeously bound the hardback is in a textured cover which is a delight to hold. This is very much in keeping with Satish’s philosophy that the objects we create and use should be beautiful, sustainable and should be durable and able to last for a long time. The inner landscape of spirituality and the outer landscape of sustainability are intricately linked. We need to cultivate compassion, seek truth, appreciate beauty and work for self-realisation. The contemporary environmental movement, in the main, follows the path of empirical science, rational thinking, data collection and external action. This is good as far as it goes, but it does not go far enough. We need to include care of the soul as part of the care of the planet. Happiness is your birthright, but you have to claim it and you have to take charge of it. But you like to have wrong views, wrong thinking, take wrong action, work at wrong jobs, eat wrong food – and yet you want to be happy, you want no suffering and no pain. How? Before you learn philosophy, languages, literature or any other subject, you need to learn humility. Through humility you gain knowledge and then from knowledge you learn even more humility. For Tagore, divinity is not in otherworldly quests, not to be found in ornate and extravagant temples and palaces, not in ego-driven achievements of wealth, power, consumerism and materialism, but in a simple, elegant and natural way of being. The ordinary is the most extra-ordinary and the meek is the most marvelous. When we have lost the simple and ordinary then we will know the value of them. Satish is a teacher who has always walked his talk, and always found ways to put his philosophy into practice, and Soil Soul Society offers a great deal of food for thought for anyone involved in education, both for children and adults alike. Satish has always sought holistic solutions to the problems we as humanity face, and through those great teachers who have inspired him on his path, so in this new book we can take a huge amount of inspiration from Satish. It is an excellent introduction to the gentle teachings and philosophy of Satish, and provides much many practical ideas for how we can actively move into this new paradigm, one which encapsulates ecological, spiritual and social dimensions. I read the book slowly, one part at a time early each morning, and I am sure it will inspire and uplift many people around the world as it already has done for me. Thanks for this, Simon! This is a book I have been waiting for. Is it available in hardcopy in the US? Hi Denise, I do not know for certain but there do seem to be some resellers on Amazon who are dispatching from the US so it does seem to be available. Let’s catch up soon!